Each year the SDSGA awards the "Shepherd's Award" to an individual, business, organization or industry affiliate in appreciation for dedicated service and support for our organization and the sheep industry in South Dakota. Nominations for this award can be made by any member of the SDSGA and directed to the Awards Committee or to one of the SDSGA directors. One common characteristic of all the past recipients is their dedication and strong commitment to the sheep industry – no matter the circumstances or challenges facing them. This year's recipient handily met the criteria. This year we are honored to present the Shepherd's Award to Van Well Livestock. Starting as a sheep shearing business in the 1990s, Van Well Livestock has grown to become the biggest sheep aggregation business in the northern Great Plains. They are currently responsible for marketing upwards of 150,000 fat lambs from this region. That averages out to about eight semi-loads of lambs per week. The Van Well buying station at Glacial Lakes Livestock Barn in Watertown, S.D., attracts producers from a wide radius – purchasing feeder lambs, cull ewes and fat lambs. The Van Wells also acquire market lambs and other sheep from a network of buyers from about 10 other sale barns in the Dakotas and surrounding area. Another facet of Van Well Livestock is the placement of commercial breeding ewes with producers wishing to add to their own flocks. The success and growth attributed to Van Well Livestock is the result of providing a reliable marketplace for producers in our area through a strong work ethic and honest dealings. The past successes – the growth that Van Well Livestock has accomplished can be attributed largely to its founder Dion Van Well, who unexpectedly passed away in January 2014. Individually, we all lost a great friend. As an industry, we lost a great advocate and an innovative producer who was dedicated to making the sheep industry better. Fortunately, these same strengths and sentiments are shared by Dion's family – and their dedication and determination will carry forward the accomplishments of the past and build the successes for the future. We have all lost Dion, but we all share in his legacy as Van Well Livestock continues the commitment to the sheep industry. The S.D. 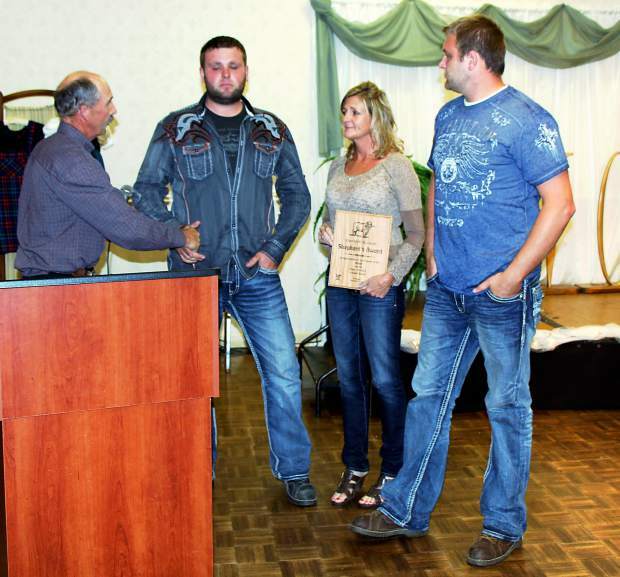 SheepGrowers Association was honored to present the 2014 Shepherd's Award to Stephanie, Trevor and Travis – Van Well Livestock.